To illustrate how radically the face of Mars has evolved over the past several billion years, researchers from NASA's MAVEN mission have put together a revealing new video showing a Red Planet that was once anything but. MAVEN, the Mars Atmosphere and Volatile EvolutioN project, is a research mission and planned space probe primarily concerned with Martian climate change. In anticipation of the mission, which is set to launch this coming Monday November 18, the folks at MAVEN have released a video highlighting the nature of their work — which is to figure out how and why Mars lost its atmosphere. The probe is set to enter into Mars's orbit in September of 2014. Indeed, Mars may be cold and barren right now, but it wasn't always that way. Billions of years ago it had a thick atmosphere that was warm enough to support oceans and lakes of liquid water. 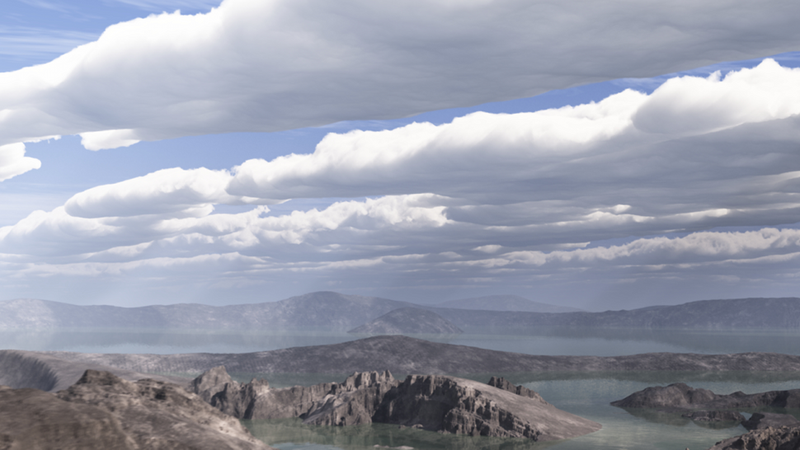 Back then, the Red Planet was very Earth-like, featuring fluffy white clouds, blue skies, and majestic grey-black mountains. Oh, and the odd impact crater or two. It's a planet that may have contained the right ingredients for life — and in fact, it may have even been able to spawn life quicker than the Earth. But gradually, as the climate shifted from a warm and wet climate to one cold and dry, its lakes evaporated and froze over; its atmosphere transitioned to the dusty pink and tan hues we see today. The MAVEN mission will work to find the reasons behind this dramatic transition.